Upstart Blind River Beavers are back in contention with the Soo Thunderbirds in their Northern Ontario Jr. Hockey League playoff series. Playing at home on Tuesday, Blind River eked out a 3-2 decision over the Soo, which now leads the best-of-seven West Division semi-final set two games to one. Blind River will try to even the series with another home game win on Friday. In Tuesday’s Game 3 victory, the no. 4 seed Beavers — who finished 32 points behind the first-place Thunderbirds during the regular season — got goals from Nathan Engel, Ryan Peck and Jordan Ritchie. A defenseman, Ritchie spent the full 2018-2019 season with the Soo Major Thunderbirds of the Great North Midget Hockey League. Lucas Theriault and Spencer Van Tiem replied for the Soo. Blind River goalie Jackson Hjelle made 20 saves in the Beavers net. 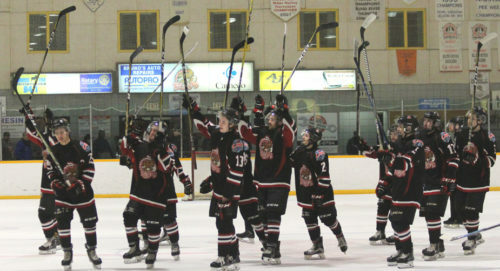 PHOTO: Blind River Beavers salute their fans after the Game 3 victory. Sure would be nice to have Sudbury refs in the Soo on Sunday.